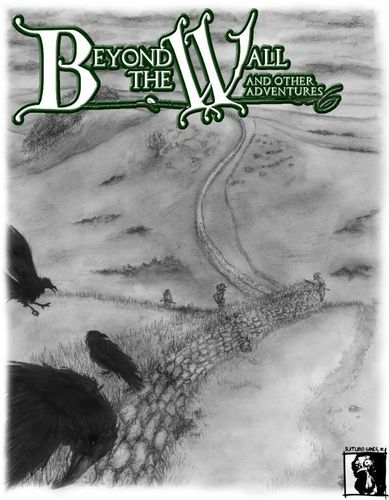 Beyond the Wall and Other Adventures (hereafter, "BTW") is an old-school renaissance game by John Cocking and Peter S. Williams that uses familiar class-and-level mechanics to emulate the feel of young adult fantasy novels such as Alexander's Chronicles of Prydain and Le Guin's Earthsea books. Young adult fantasy is perhaps not as well-known as the more popular fantasy sub genres, but it is as distinct from traditional high fantasy as that genre is from sword and sorcery, urban fantasy, and the rest. The defining feature of YA fantasy, other than being written and marketed to 12-18 year olds, is a young or adolescent protagonist in a fantastic world who deals with issues of identity and coming of age. Other elements of the Campbellian "hero's journey" are often present as well: leaving a place of safety, meeting and journeying with a variety of companions, an old mentor who frequently perishes near the end of the story, and so on. They are primarily personal stories as opposed to epic stories of good and evil -- although the battle of good versus evil is usually present, it is typically portrayed as a background against which the hero(ine) must make choices, as opposed to the central part of the narrative. BTW further limits itself only to drawing inspiration from that subset of YA fantasy set in the pseudo-medieval milieu we all know and love. So no young children in our beloved modern England of tikka masala and football hooligans finding that they are heirs to a parallel-yet-secret world of wizards; no gripping romantic triangles between vampires, werewolves, and young women with no personality. It also attempts, in a nod to our modern overscheduled lives, to be playable in one night, going from character creation to the conclusion of an adventure with little or no prep. - The traditional six stats. - Three classes (warriors, rogues, mages). - Levels (but ten, not twenty). - Saving throws (five of them). Onto this well-worn framework the designers throw a few wrinkles: Fortune Points allow PCs to reroll a failed roll, or to stop bleeding out after falling unconscious. A skill system gives bonuses to ability scores when making ability checks that relate to the skill -- for example, if you have the Stealth skill then you get +2 to your Dex when attempting to be sneaky. Character creation is designed to be done as a group. Each player chooses an archetype ("Young Woodsman," "Would-Be Knight," "Witch's Prentice," or three others). Each archetype has a four-page character creation workbook. The workbook presents a kind of very simple lifepath system. It gives starting stats, and then each player takes turns rolling on a series of tables, each of which determines an element of their character's history. - archetype, which determines class. - a small amount of disposable income for equipment (4d6 silvers). - most importantly, once (and only once!) during character creation, a player may ignore a particular die roll and instead pick the result he wants. So if your Would-Be Knight gets a weapon specialization of a mace, and you had your heart set on a great sword, then you can pick the great sword result. By the end of character creation you have a very straightforward character sheet that is comfort food to anyone with any time in the hobby, and as a bonus, not too intimidating to new players. But more importantly, you will have a table full of PCs that is connected to each other by more than just mechanics, but actually has a history and is ready to go adventuring. The magic system used will have a huge impact on the flavor of any fantasy game, so it's a bit of a minefield for the budding game designer. Cocking and Williams manage to tone down the bombastic flavor of Gygax's battlefield magic in favor of a more appropriate, subdued system that still fits nicely into the classic framework. There are three types of magic: Cantrips, Spells, and Rituals. Cantrips are minor magics. To cast, you make an ability check (roll equal to or less than your Wis or Int, depending on the cantrip). On a success the cantrip is cast. On a failure the player chooses: either he is exhausted and cannot cast any magic whatsoever until he gets a full night's sleep, or the spell backfires and the GM chooses a fumble-type effect. Spells are more powerful. All spells are considered equal in power, there are no "spell levels" as in other games. A mage may cast a number of spells per day equal to his level, so a fifth-level mage can cast five spells per day. Burning Hands, for example, is a spell. Spells require no attribute check, so there is no chance of failure. Rituals are the most powerful magic in the world, or at least that which is available to humans. They do have levels, and a mage must be at least of that character level to cast the ritual. So a third-level mage can cast rituals of level one, two, or three. Each ritual takes a number of hours to cast equal to its level, plus a successful Int or Wis check depending on the ritual. Many traditional D&D effects are recast as rituals, so the magic is often there but removed from common everyday casting. This is a clever way to keep the spells that experienced players are used to, but make them difficult enough to cast that the desired tone of YA fantasy is preserved. For example, Flight is a sixth-level ritual. Most characters in YA fantasy are not constantly zipping through the skies, but a sufficiently dedicated and experienced hero might -- with six hours of concentration and an Int check -- pull it off. Cantrips and spells need no special components, but rituals do. Goodberry -- here a level one ritual -- requires that the mage not only have clean, fresh berries to work with; but he must wash them with pure water from a fresh spring and store them in a never-before used pouch of soft leather which he has stitched closed himself. While spell components are often ignored in many RPGs, for rituals they seem both thematic and appropriate: magic is tied to the way the world works, and it has its own rules. It is not just a super power that the mage has. Here's how this works: The GM chooses a scenario pack. Currently there are two: The Hidden Cult and The Goblin Infestation. While the players are going around the table making their characters, the GM is taking notes. Some tables on the character worksheet have a symbol, either a scroll or a hand or nothing. If it has a scroll, that means a location. When a player rolls on that table, he gets to add a location to the town map. It can be related to the roll or not, as inspiration dictates. A hand indicates an NPC to be added to the map. Again, related to the roll or not. A kindly innkeeper? A surly pony-trader? Whatever you like. So that's all well and good, but what does the GM do? Well, she listens as characters are created, and writes stuff down on her scenario worksheets. Each scenario pack has a series of random tables, but the tables are blank! For example, in The Hidden Cult, the first table is entitled "Who or What Has Betrayed the Characters?" There are eight blank lines, which the GM fills with people or things from the first three PC workbook tables. At the conclusion of character creation she rolls 1d8, and that's who's betrayed the PCs. There's a similar table for what the cult wants. Some of the later tables are pre-filled, so when the GM determines the cult's true purpose, she might discover that it wants to allow the townsfolk to be possessed by minor demons to become their servants, or perhaps it wants to murder all the villagers as a sign of devotion to their masters. Further tables in the scenario pack allow for the introduction of twists in the story, as well as "dungeons" (not literally [usually] but dark places beneath the earth in some form or another). Mapping 10'x10' squares is not genre-appropriate, but the GM will have an idea of what this dungeon is about; what's weird, scary, or dangerous about it; and what needs to be done. Finally, the scenario is rounded out with a short bestiary of appropriate creatures for the scenario. Once all this is established it's a matter of throwing things in front of the PCs and connecting the dots. You'll have a pregnant situation of NPCs, motivations, and locations. Mix, bake, and voila! Instant adventure! As a bonus, each scenario includes additional tables for further adventure. A PC might find a clue left by the cult that leads to the next adventure, and so on. This style of adventure is really, really, interesting and manages to carve out a "third way" between traditional adventures -- wherein everything is laid out for the GM to assimilate before play, and then be ready to bring to the table -- and story games, where everyone at the table gets to throw stuff in willy-nilly for all to riff off of. This style uses the kind of guided or structured creativity that is very useful. It provides enough of a framework to work with, without burning yourself out on coming up with the basic story elements. You'll have enough creative juice left to get inspired by the suggestions of the scenario pack, and be able to throw them at your players for maximum effect. So Does It Meet Its Goals? Goal #1: Emulate YA fantasy. Almost perfectly. The PC workbooks and the magic are completely spot-on, absolutely brilliant in execution. A few weird spots in the rules seem like legacy elements -- for examples, rules about henchmen and hirelings. YA fantasy is more about friends than hiring mercenaries. Characters are pretty powerful compared to, say, RAW B/X, so the need is not as great. Furthermore, the XP rules are a little weird -- no 1GP=1XP, which might be appropriate for Joe Murderhobo, but not for Eilonwy of the Red-Gold Hair, Princess of the House of Llyr (you might as well stab a tree and call yourself a mighty hero). It seems more heavily based on defeating enemies than is really appropriate. Goal #2: No-prep adventuring. Quite good, with only two caveats. One, there are only two scenario packs. While this can provide for many nights of fun (after all, look at the mileage that Lady Blackbird has gotten out of one scenario), it would be really great to have more. Two, this is not a game for beginning GMs. This is for experienced people in the hobby, comfortable with thinking on their feet and improvising entertainingly and well. Or alternately, for experienced people in the hobby who are comfortable adapting scenarios for a slightly different ruleset, or making up their own scenarios wholesale. - It's such a good, streamlined game -- strong in flavor but easy enough for players new to the hobby -- that having skill check be roll-under seems like a missed opportunity. Rolling high for everything would've been easier and simpler. - Similarly, having the old-style savings throws (Poison, Polymorph, etc.) also seems like a waste. There are rules in the appendix for the simple and intuitive 3rd/4th style of Reflex, Fortitude, and Will, but there's no character sheet for this -- the only official sheet has the five saves. - XP is a little weird. Grafting the experience system of a treasure-hunting game onto a YA fantasy game is a poor fit. Something a little more genre-appropriate would be better, although I admit that I don't have a lot of great ideas. - You love YA fantasy. - You primarily like class/level games, but enjoy new twists on them. - You find the idea of AW-style playbooks, adapted for B/X mechanics, intriguing. - You want semi-structured no-prep play that provides fun improvisational setups without going full-bore into GM-less hippieland. - You can't stand classes and levels. - You need a crunchy game. - You hate semi-random chargen. Yes, the game includes an option for nonrandom, but this requires discarding some of the best parts of the game. - You want high-magic, high-fantasy, high-power gaming. - You want grim and gritty gaming. … but the printed version bounds them as one, for no real reason. It doesn't repaginate either, so it is difficult to look things up based on page number. I recommend sticking with the PDFs. - A scenario pack wherein the PCs must repel a goblin infestation. - PC Workbooks for creating dwarf, elf, and halfling characters. - PC Workbooks for creating noble characters. And (limited) support is available at the publisher's website. May all roads ultimately lead within, and may all your pigs be oracular. I have this and have read parts of it; it looks great. I love the character and scenario generation. While more scenario packs would be nice, I'd like to see some that aren't dependent on creating new characters to build the scenario. After all, if I want to play a campaign I'm only going to do character creation once, but I'd still like to be able to sit down and play a scenario with no prep at third or fifth level after several adventures. Great review Kevin. Chad pointed me to this gem, and I really think highly of the game. Your "Don't Buy It If" part I can tell you is accurate. When my lead murderhobo found out that casting a Fireball would take hours to accomplish, he literally gave me a and a . Sigh. Ben, that's a great point. I agree that scenarios for later in the campaign seem like a good idea. It doesn't seem like it'd be that hard to produce the kind of skeletal template that the two scenario packs have, just focused on harder foes. The GM could fill in the answers with things already established in the game. While technically that is "prep," the dirty little secret is that the game is not actually NO prep -- the prep just takes place simultaneously with chargen. But it is LOW prep, and the kind of prep it takes to fill in some tables and roll is pretty doable compared to say, reading through Masks of Nyarlathotep and figuring out what you're going to do. Thank you for this review. This sounds like a game I'd like a lot; I went ahead and bought the print/PDF bundle, and I'll look for an opportunity to try it out. I really like the sound of this and I love that artwork. I know you recommended buying the PDF but do you know if the hard copy is the sort of thing that's going to show up in shops? I don't really do PDFs, mainly because I just can't look after them - they always end up as a dog eared, untidy pile of crap on the bottom of my game's shelf! However, DriveThru prints through Lightning Source, which has printing facilities in the UK, so it shouldn't be too prohibitive for you to get the hardback if you like. Awesome review, Kevin, Thanks! I hadn't read much about this game. Can this game be played with other OSR game adventures like DCC, LL, etc? Broadly, yes. You might have to tweak the stats slightly for the monsters. More challenging would be getting the tone right. DCC's gonzo adventures, while awesome, are not really the feel that BTW is going for.